CellarPro's Air Handler AH18Sx split cooling system (1 1/2 Ton Nominal) features powerful, variable-speed centrifugal fans in the evaporator module that can handle ducting up to 100 equivalent feet using 12-inch flex duct (50 equivalent feet with 10-inch ducting). The split air cooled condensing unit is designed to handle environments ranging from 12F to 110F. The condensing unit requires 24 inches of unobstructed space. Configuration requirements are as follows:. Cold side Exhaust is on the side and cellar Intake is on the end. 208-230V/1PH/60HZ dual power supplies, with a 15 amp circuit for the evaporator module, and a dedicated 20 amp circuit for the condensing unit. 24VAC control wiring is required between the main temperature controller and the evaporator, and between the evaporator and the condensing unit. Split systems include a refrigerant pump-down solenoid valve to prevent liquid slugging. Units are evacuated and charged with dry nitrogen. Humidification systems and heating systems for low ambient conditions can be factory-installed at additional cost. Consult owners manual for power requirements for these options. Ducting of cold supply/return air will result in additional heat loss and loss of cooling unit efficiency. Please use our ducting heat loss table and our duct correction table when sizing the cooling unit. 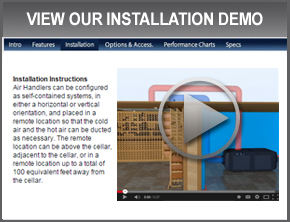 CellarPro AH18Sx Air Handler Cooling System (P/N 15093). Our Split Air Handler is rated for exterior usage and designed for cellars up to 5000 cubic feet, providing ducted refrigeration specifically designed for wine cellars. Low Ambient Head Pressure Control Kit #10437: supports the unit in temperatures below 12F and as low as -20F. Integrated Heater #16672: adds heat through the cooling system when the cellar is in an unheated environment and will be exposed to temperatures below desired wine storage temperatures. Integrated Humidifier #18325: provides humidification with digital control inside the cellar when attached to an external water line.